Manchester United take on Juventus in Turin in this evening’s Champions League, but as they make this important trip to Italy they may want to take the time to thrash out potential deals for the January transfer window. Many of United’s top rumoured targets play in Serie A at the moment, so it may well be that they’ll be doing Juventus a big favour in the near future by raiding some star names from their rivals. In doing so, however, the Red Devils could also find the best quality talent to address the weaknesses in this squad, with those areas of vulnerability likely to be punished again by a strong Juve side this evening. In defence, it seems clear United are crying out for one world class centre-back with his best years also still to come. They need not look further than Inter Milan star Milan Skriniar, who was recently linked as one of United’s top January targets by ESPN, stating he’d likely cost around £40million. That’s a bargain fee for a 23-year-old who could dominate for years to come in the Premier League, and finally give MUFC a back-line they can trust after a difficult first half of the season. Jose Mourinho’s side have already conceded a remarkable 18 goals in 11 league matches this season – only five teams in the whole division have conceded more, and they occupy five of the six bottom positions in the table. But it’s not just defensively where United need to improve – they have been admittedly quite unlucky with just how badly Alexis Sanchez and Romelu Lukaku in particular have let them down. The duo have just five goals between them in all competitions this season and surely need replacing urgently, with Napoli’s Lorenzo Insigne surely the ideal candidate. Don Balon claim Barcelona are showing an interest in the in-form Italy international, who looks one of the best all-round attacking players in Europe right now. That piece suggests Napoli would set a high asking price for their star player – around £87m – but that should be well within United’s reach, especially if they sell others. It’s quite feasible that Sanchez will soon be offloaded, with the Sun among the sources recently stating the club had given up on him and were trying to work out ways to get rid of him. Insigne is precisely the player United thought Sanchez would be for them – capable of playing out wide or up front, of creating and of scoring. The 27-year-old is at the peak of his powers right now and has ten goals and three assists so far this season. Some will look at his size and physique and wonder if he’s right for the Premier League, but it is increasingly shown that small, fast and agile footballers can excel at the highest level, and he’s as talented as any of them. 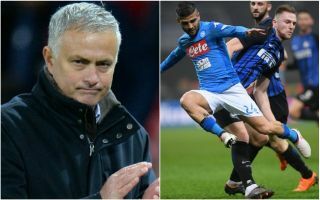 Costing a combined £127m, Skriniar and Insigne would fix two glaring problems at both ends of the pitch for Mourinho’s side in the second half of the season, so let’s hope they take advantage of this potential bargain double deal.